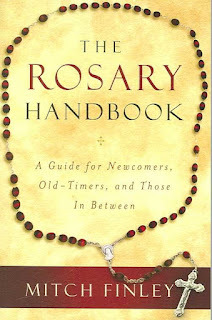 I received a review copy of Mitch Finley's book, The Rosary Handbook: A Guide for Newcomers, Old-Timers, and Those in Between a few days ago and will be reviewing it here. The book is a short book with 143 pages. I took about 30-45 minutes to finish it. The Rosary Handbook gives a lot of insight into the most popular devotional prayer found in Catholicism. Author Mitch Finley wastes no time going into detail. In the introduction and first chapter, Finley uses anecdotes to present the Rosary to readers. Using personal stories, he presents the Rosary as something that is useful and fruitful in everyday life. At the same time, he shares the ups and downs the Rosary had during the Vatican II changes and how it made a comeback. The personal stories Finley shares help present the Rosary as more than just a prayer, but a way a life that is probably the first thing that identifies a Christian as a Catholic one. Moreover, in chapter 2, he shares the history of the Rosary, going into detail how the devotional prayer developed from the Psalter into the version we use today. Finley leaves no stone unturned as he shares that contrary to popular belief, the Rosary was not given to St. Dominic by Our Lady. This may come as a shock to some Catholics, especially those who may not be too well informed about the faith and learn the easy "Sunday school" version of it in CCD or catechetical classes for First Communion of Confirmation. However, Finley does not bash the Rosary or the Dominican order. He shares the facts and does a good job at it. Honest Catholics will appreciate the facts and the evolution of the Rosary throughout the centuries. In chapter 3, Finley goes through each prayer of the Rosary giving "fun facts" about each. Readers will especially enjoy this chapter because Finley does a great job explaining each prayer. He goes line by line explaining what the phrases mean which will enrich readers and possibly bring them to say the prayers with more awareness as opposed to mechanically. In chapter 4, he does the same thing as in chapter 3, but with the mysteries of the Rosary. He begins by explaining what a mystery is and how the idea was incorporated into the early versions of the Rosary which would lead to the formation of the "mysteries." Finley explains how the mysteries were narrowed down to 15 and then increased to 20 by Saint Pope John Paul II in 2002 when he added the Luminous Mysteries. Chapter 4 is the longest chapter but is rich in the explanation for each mystery. Finley uses Sacred Scripture to expound on each mystery which brings a lot of insight. This chapter will be very beneficial for those who really love to meditate using the Rosary. Unfortunately, some Catholics recite the Rosary mechanically, almost in a rush to get it in as if it were a chore. Finley shares some wonderful explanations which help bring each mystery alive and shows the beauty of the Rosary. Protestants who may read his book will realize that the Rosary is a visitation into the events of the Gospel and not "worship of Mary." Lastly, in chapter 5, Finley explains the methods behind praying the Rosary using a chart and explaining what prayer to say, where to say it and what mystery to meditate on. He meticulously goes through each so the reader who never heard of the Rosary or is curious to prayer it can do so with ease. Once reading this chapter, the reader who may be a novice at the Rosary will become an expert praying it. 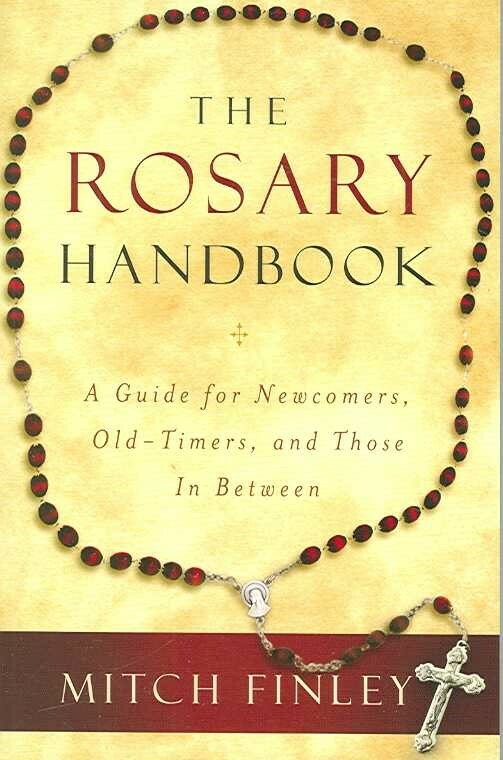 The book The Rosary Handbook: A Guide for Newcomers, Old-Timers, and Those in Between is a great read. It is true to its title as a guide for newcomers, old-timers and those in between. I wish I had this book during my transition from Atheism to Catholicism. It would have been a great resource for me as I searched Catholicism among other faiths. The book has some grammatical and spelling errors such as on page 10 "twenty-firstst," nothing too serious. It also fails to give credit to Our Lady of Fatima for the "Oh my Jesus" prayer on page 66. Another error I found is on page 59 where Finley states that the "Our Father begins the Liturgy of the Eucharist." This is not correct. The Liturgy of the Eucharist begins at the presentation of the gifts (see: http://www.usccb.org/prayer-and-worship/the-mass/order-of-mass/). I think what Finley meant to state was that the Our Father begins the COMMUNION RITE, not the Liturgy of the Eucharist. In any event, these can be corrected and do not take away from the book as a whole. Again, I recommend this book to all Catholics and those who are curious about the Rosary. This book will enrich your knowledge and experience with the Rosary. My only complain and wish is that the author should have put in a references section so readers can find where he got his information from and do further studying. Hopefully, future editions will have one. This book is a must have and should be on every Catholic's bookshelf.